It’s finally Songkran season! Entering the so-called ‘holiday-month April’, as we countdown to the water fights and the city’s best parties, it’s also time to start thinking about how we want to spend those rare long holidays. With enough free time to forget about our responsibilities for a while, the question of “where to eat” becomes more pressing — and exciting! — than ever. Among the gourmet options Bangkok has in store, we see the return of Khao Chae, a refreshing Thai delicacy commonly served during warmer days. Along with that are also new cocktail options, enticing seasonal summer menus as well as an exciting eco-friendly outdoor market concept. Scroll to see where you’ll be treating yourself this month! At this time of year when Bangkok’s sun is at its hottest, few things beat enjoying your meal with cool, refreshing drinks — except maybe a combination of them both. Enter Khao Chae, a dish of steamed jasmine rice soaked in scented jasmine water and served with special condiments. Usually found during the warmest seasons, the local Thai delicacy originated during the reign of King Rama IV, and was initially served only in royal residences and amongst society’s elite. 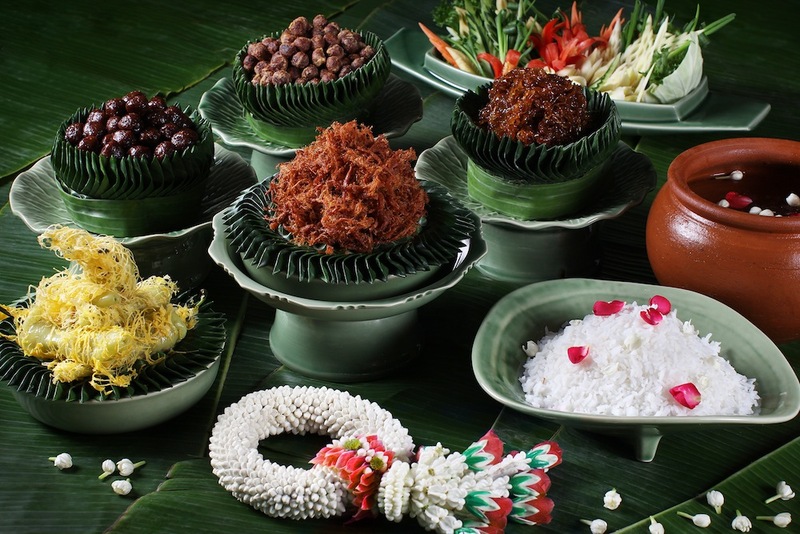 Today, you can enjoy the dish at Grand Hyatt Erawan Bangkok’s Erawan Tea Room — get booking now! THB599++ for a set. 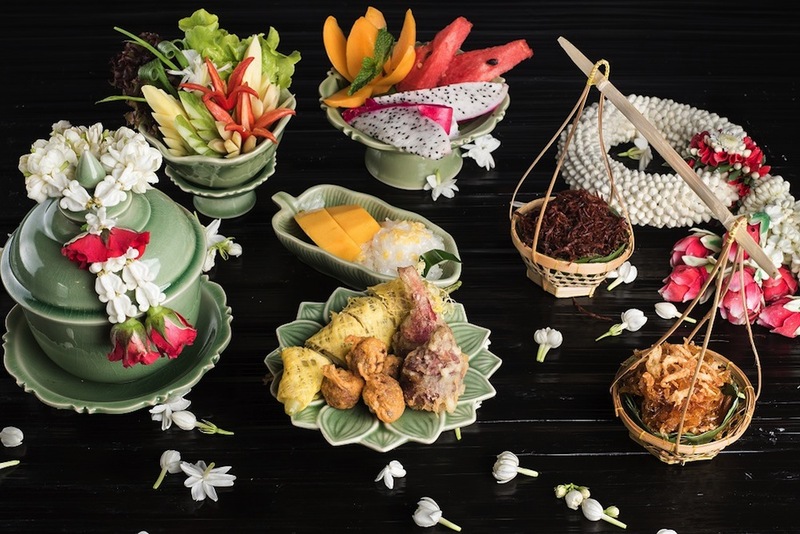 The Erawan Summer Food Festival is available from April 5 – 16, 2019. To reserve your seats or find out more, call 0 2254 6250, or email restaurants.bangh@hyatt.com. If you just can’t get enough of the delightful Thai dish, don’t fret — its’ popularity this time of year means it is also very readily available! For more, head over to Shangri-La Hotel’s Next2 Café. Expect beautifully presented servings of Khao Chae Chao Wang, complemented by side dishes of deep-fried shrimp paste balls, deep-fried shallots and shredded pork, green chilli wrapped in egg, caramelised fish flakes, sweet shredded pork and stir-fried sweet pickled chinese turnips with eggs. THB1,200 per person. Khao Chae Chao Wang is available from April 10 – 16, 2019. Next2 Café, Shangri-La Hotel Bangkok. To reserve your seats or find out more, call 0 2236 7777, or visit shangri-la.com. 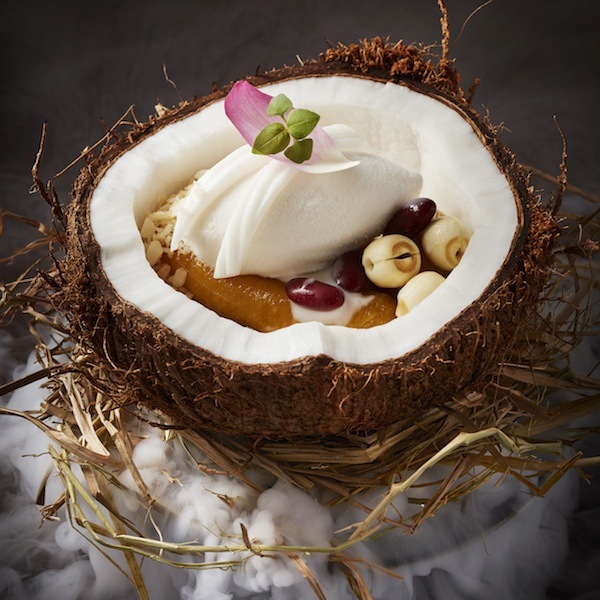 2019 has been an eventful year for R-Haan, as the Thai fine-dining destination celebrates its one year milestone and a newly-awarded Michelin star. As part of the celebration, celebrity chef Chumpol Jangprai has released a new weekend menu especially created for the summer season, inspired by seasonal wonders and old Royal Thai recipes. From Sing Buri sundried river fish mixed with sugar and deep fried shallots, to crispy rice crackers with mint, pork, shrimps and peanuts, the highlights are created using fresh, locally grown ingredients and served in beautiful hand-painted ceramic tableware — exquisite items that were once used in the Royal Palace during the Rattanakosin era. A perfect way to while away the summer days. Available only on weekends, from 11am-2:30pm until May 9. R-Haan Restaurant. To reserve your seats or find out more, call 09 5141 5524, or visit r-haan.com. A new season has arrived, and fans of Michelin-starred Sra Bua by Kiin Kiin will know this means a new menu. To celebrate the return of our hotter days, chefs Henrik Yde Andersen and Chayawee Suthcharitchan collaborate to create their latest dinner menu, based on the vibrant flavours found in quality seasonal ingredients. 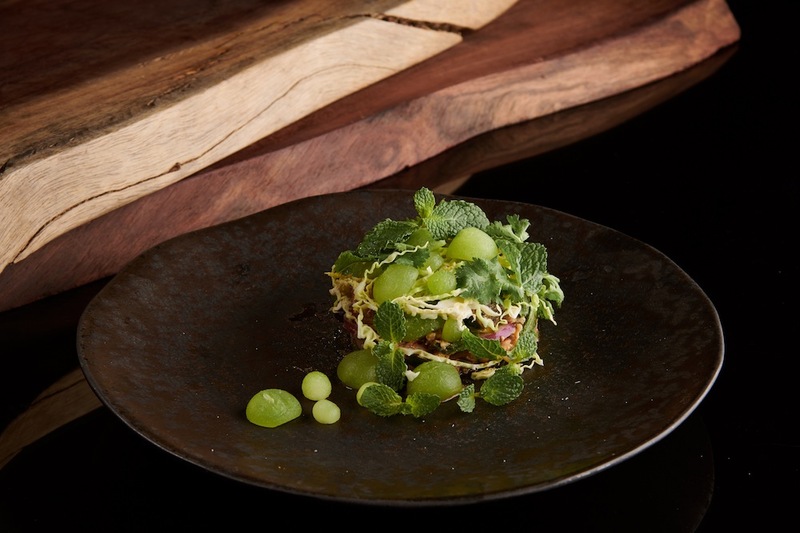 Expect the likes of Thai ceviche with halibut passion fruit, larb duck salad served with foie gras and mint, as well as sea bass prepared with five spices and fennel. The meal reaches a sweet, sweet end with the delicious and beautiful Flowers of Thailand dessert by artist Vers Yves Klein. THB3,200++ for food only. 12-3pm, from April 1 onwards. Sra Bua by Kiin Kiin, Siam Kempinski Hotel Bangkok. TO reserve your seats or find out more, call 0 2162 9000, or visit srabuabykiinkiin.com. When it comes to Bangkok’s warmer days, your summer cravings can go both ways — sometimes you want to try something out-of-the-box like Khao Chae, and then there are days when you just want a good glass of sparkling wine. On those days, head straight over to McManus Brothers Oyster Bar. 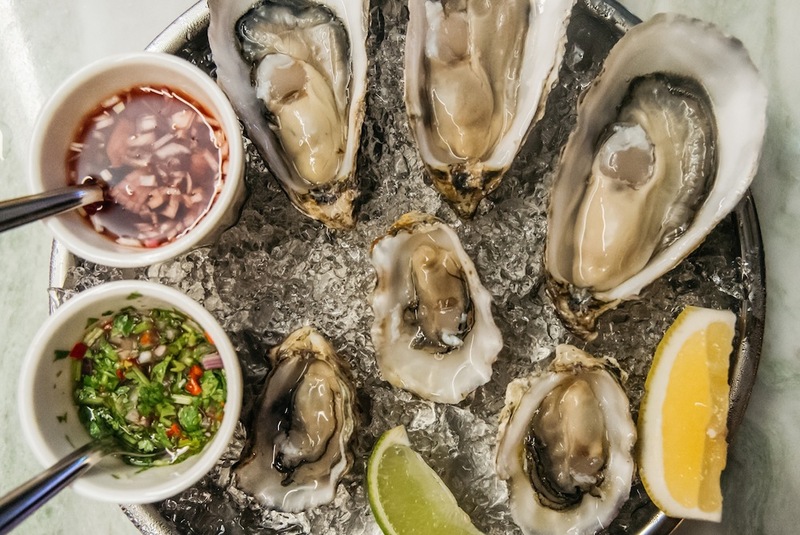 Famed for its decade-long experience in dishing out fresh oysters and perfectly paired Prosecco from its branch in London, McManus Brothers Oyster Bar has come to Thailand at Thonglor’s buzzing 72 Courtyard. Go for the premium, fresh-from-the-sea selection of oysters sourced from over 20 farms across the United Kingdom, and stay because rarely will you ever find a drink that pairs as well as the DOCG Italian Prosecco they serve. THB1,570 for a dozen oysters and a bottle of Prosecco. Open 6pm-1am, Sunday – Tuesday. To find out more, visit FB@McManusBrothersOysterBar. With the temperature absurdly close to 40°C, this marks the perfect time to stay indoors and enjoy a refreshing cocktail — preferably those with fresh flavours. 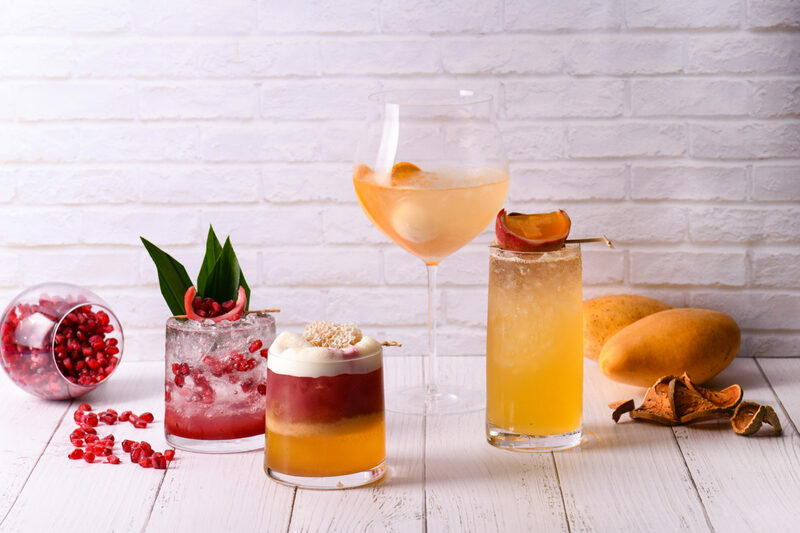 Over at The Okura Prestige’s Up & Above Bar, the creative mixologists have come up with three refreshing new cocktails using Thailand’s best seasonal fruits, blended with premium spirits from Thailand, Japan and Cuba. Our favourite is The Ratchaburi Mango — a strong mix of Havana rum, fresh Ok-rong mango, bael syrup and fresh lime — although the zesty Miss Nakornpathom with Phaya premium Thai rum and fresh pomelo, oranges and lime is also very much worth trying. Prices start at THB290++. Noon-midnight until June 30. Up & Above Bar, The Okura Prestige Bangkok Hotel. To reserve your seats or find out more, call 0 2687 9000 or email upandabove@okurabangkok.com. As if we needed anymore reason to visit Thonglor, here’s an exciting new addition to one of Bangkok’s most buzzing areas. 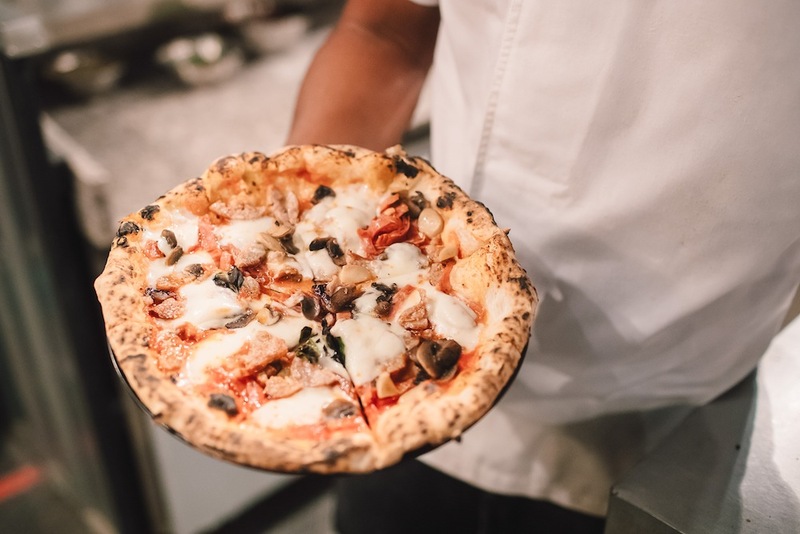 The city’s first eco-friendly, sustainable outdoor/indoor hangout venue, Model Market brings with it a plethora of cool, from fairy lights to up-cycled metal sculptures and some of the top food-related names in town. Plastic straws and other non-biodegradable items are forbidden from the hip venue, while all foods are set to be composted through a sustainability organisation. There’s even a recycling studio by ‘The Remaker’ — known for creating items such as leather bags, jackets and shoes from discarded materials and a fun bicycle-powered smoothie blender. It sounds like an environmentally-conscious dream come true, but this is just the surface — future plans include a collaboration recycle and sustainability organisations to form an eco-market where people can come, drop-off or pick up donated items. If you’re there for the food, get ready for a gathering of the very best, including Peppina, Fatboy Smokehouse, Koryo Buffet, and even our former Arena 10 favourite — Meng Kee Hong Kong Roast. Drinks are naturally spearheaded by names such as Tropic City, Mikkellers and Bootleg Brothers. Not much of a drinker? No worries, there’s coffee too, courtesy of Nitro Lab. Open everyday from 5pm till late. Model Market, Sukhumvit Soi 53. To find out more, visit the official Facebook page.